Sitting beneath one of Melbourne’s great symbols – the magnificent spire – Arts Centre Melbourne is both a defining Melbourne landmark and Australia’s largest and busiest performing arts centre. From 2017, Sydney Dance Company is proud to call this performing arts centre our Melbourne home. The Arts Centre Melbourne Box Office is open daily from 10am to 6:45pm from January to March and 10am to 5:45pm from April to June as well as 90 minutes prior to performance time. Open 24 hours a day, our car park entrance is located on Sturt Street. Parking options include early bird, standardor valet parking. For more information on available parking options please visit the Arts Centre Car Parking page. All levels of the Arts Centre Melbourne Car Park are fully wheelchair accessible. There are also four disabled parking spaces along Dodds Street, each with a four hour restriction. Get off at Flinders Street Station in Melbourne CBD and walk for a couple minutes toward St Kilda Road. 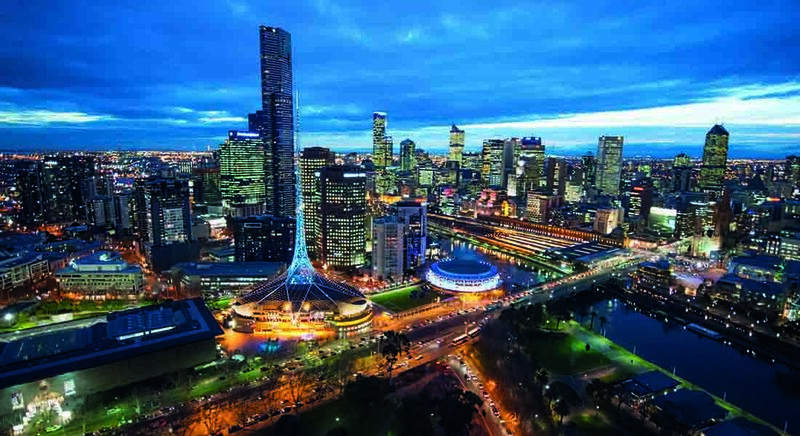 The Melbourne City Tourist Shuttle runs in a loop through Melbourne CBD every 30 minutes, and stops at Arts Centre Melbourne on St Kilda Road (Stop 1). A range of dining options are available before and during your performance. Enjoy a quick bite or drink before your show from one of the theatre building’s many dining spaces. Refreshments are also available from the foyer bars. A vibrant and modern atmosphere, with a focus on seasonal produce, great wine and a classic cocktail list. Located in the Theatres Building offering baguettes, bagels and wraps for those looking for a bite to eat before a show. Settle in and soak up the atmosphere post show while enjoying a glass of bubbles and a plate of antipasto, or choose to feast from a delicious range of hot main courses, salads and desserts. Every Sunday, 10am – 4pm, local artisans fill Arts Centre Melbourne’s Lawn to showcase their unique, handmade goods ranging from arts and crafts to freshly made delicacies. Pizzeria & Tapas restaurant located on Melbourne’s Southbank Promenade, directly under Arts Centre Melbourne’s Hamer Hall. Specialising in European cuisine, with an emphasis on local Australian produce. Delicious coffee and freshly baked cakes and biscuits and savoury snacks in the open-air surrounds of Arts Centre Melbourne. Offers delicious simple authentic Italian food. Mezz Bar offers a range of quality food inspired by the smaller tapas-style dishes from around the Mediterranean and a wide range of premium wines. Situated alongside the breathtaking Yarra River, Saké Restaurant & Bar Hamer Hall has cemented its long-standing reputation as the most-loved and celebrated Melbourne Japanese Restaurant. For more food and drink options at the Arts Centre Melbourne please visit our Eat Drink Shop Rest page. Accessible seating is available for wheelchair users and their companions, in all Arts Centre Melbourne venues. You can book accessibility seating in person at Arts Centre Melbourne Box Office or via the telephone booking line 1300 182 183. Wheelchairs can be booked through the Concierge. Please call 9281 8298 if you require assistance. If you experience difficulty hearing, assisted listening devices are available for use in all seats of Arts Centre Melbourne venues, as well as for Guided Tours and meetings. The units are available free of charge from venue staff, and either use standard headphones or connect with your hearing aid via a neck loop. Vision Australia provides Audio Description and Tactile Tours of selected performances. For details, visit Vision Australia or contact Janene Morrison Sadhu (03) 9864 9384, Tuesdays to Thursdays, for details. Braille is used in the lifts, as well as other areas of Arts Centre Melbourne. Other services including Captioning, Tactile Tours and AUSLAN interpretation are available for selected performances. Please enquire when making your booking. The Companion Card has been developed by the Victorian Network on Recreation and Disability (VICNORD) and admits carers to shows as complimentary guests. Arts Centre Melbourne welcomes holders of this card to attend the many events on offer.